Rio de Janeiro: Rocco, 1991. This is the Brazilian paperback edition of Talking God, the ninth book in Tony Hillerman's Navajo Mystery Series. This 1991 edition was published by Editora Rocco LTDA in Rio de Janeiro, Brazil. The text was translated from English into Portuguese by Eliana Sabino. 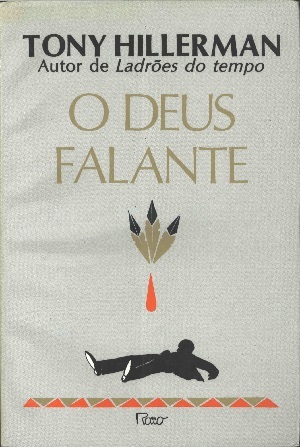 The cover, designed by Ana Maria Duarte, features four elements: three feathers, a drop of blood, a silhouette of a man sprawled on the ground and a band of interlocking triangles. Format: Paperback, 21 x 14 cm. Binding: Full color paper covers with the publisher, title, and author printed vertically on the spine.